Learning Objective: Explain the hydraulic and mechanical principles of a brake system. Describe and define the major components of hydraulic, air, and air-over-hydraulic brake systems. Explain the operation of hydraulic, air, and air-over-hydraulic brake systems. Summarize the operation of antilock braking systems. The brake system is the most important system on a vehicle from a safety standpoint. You, as the mechanic, are trusted to do every service and repair operation correctly. When working on a brake system, always keep in mind that a brake system failure could result in a fatal vehicle accident. It is up to you to make sure the vehicle brake system is in perfect operating condition before the vehicle leaves the shop. Braking action is the use of a controlled force to accomplish three basic tasks - to slow down, stop, or hold the wheels of a vehicle stationary. Braking action is accomplished by rubbing two surfaces together that cause friction and heat (fig. 7-1). Friction is the resistance to relative motion between two surfaces in contact. The brakes convert kinetic (moving) energy into heat to stop the vehicle. Heat energy is an unwanted product of friction and must be dissipated to the surrounding environment as efficiently as possible. Learning Objective: Describe the operation, terms, and component functions of a hydraulic brake system. Describe the procedures for servicing a hydraulic brake system. Figure 7-1. - Development of friction and heat. mechanism by a liquid. To understand how pressure is transmitted by a hydraulic braking system, it is necessary to understand the fundamentals of hydraulics (refer to chapter 3 of this TRAMAN). There are two common types of hydraulic brake systems used on modern vehicles - drum and disc brakes. 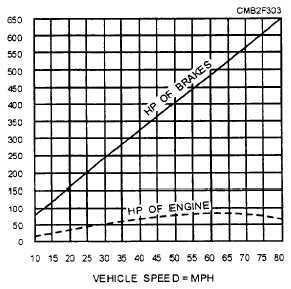 It is known that to increase the speed of a vehicle requires an increase in the power output of the engine. It is also true, although not so apparent, that an increase in speed requires an increase in the braking action to bring a vehicle to a stop (fig. 7-2). A moving vehicle, just as any other moving body, has what is known as kinetic energy. Kinetic energy is the energy an object possesses due to its relative motion. This kinetic energy, which increases with speed, must be overcome by braking action. If the speed of the vehicle is doubled, its kinetic energy is increased fourfold; therefore, four times as much energy must be overcome by the braking action. Figure 7-2. - Braking requirements.